Eggs are extra large grade AA. 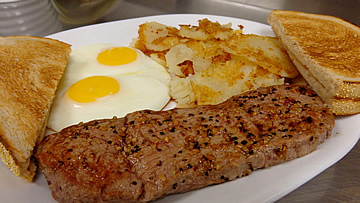 Served w/toast and choice of 3 buttermilk pancakes or potatoes. 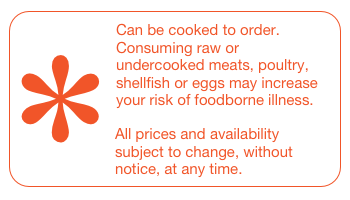 Caution: Oven-Baked items are very hot! Served with your choice of teo items: toast, buttermilk pancakes, or American fries. No substitutions on these omelettes. Bacon and 2 eggs* scrambled with cheese on grilled home baked bread. Served with fresh fruit.